We have an incredible community that has gathered around the 100 Mandalas Challenge. 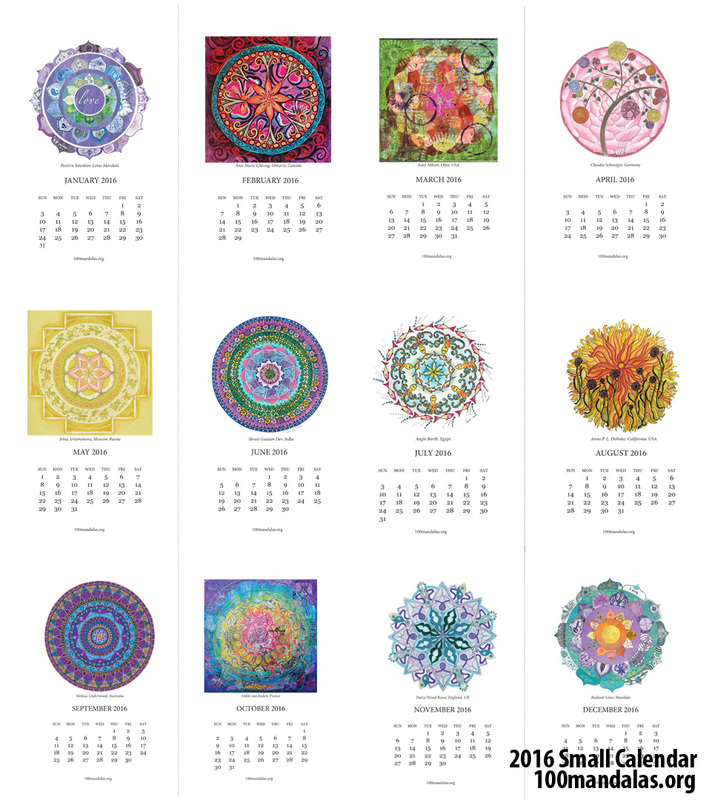 I’m so excited to share with you the first 100 Mandalas Calendar. You’ve probably already noticed that it isn’t one calendar but two! The first one is a sweet size and each month features one of ten artists. It was really hard to select ten from the fifty mandalas that were submitted. I looked for a variety of colors, styles, and mediums in making my selections. Congratulations to the featured mandala artists! Each one of you gets a complementary copy of the calendars. Watch for an e-mail from me through WeTransfer with links to the downloads. To hang my calendar I punch two holes and tied it with a lovely ribbon. A binder clip is another easy way to hang up this calendar. I love this size…it is perfect for my office as it doesn’t take up too much wall space. January and December feature two of our Community Mandala Projects. The second calendar features all 50 participants plus those who participated in the two featured Community Mandala Projects. I truly love ALL of the mandalas that were submitted. I hope you know that you all have a special place in this calendar project. You will not believe this. After I pulled this project together I did a count and we have EXACTLY 100 participants in this project. Can you believe it? I counted it twice and then pinched myself. 100 participants in the 100 Mandalas Challenge Calendar. Wow! For this calendar I have it hanging up on a clip board. 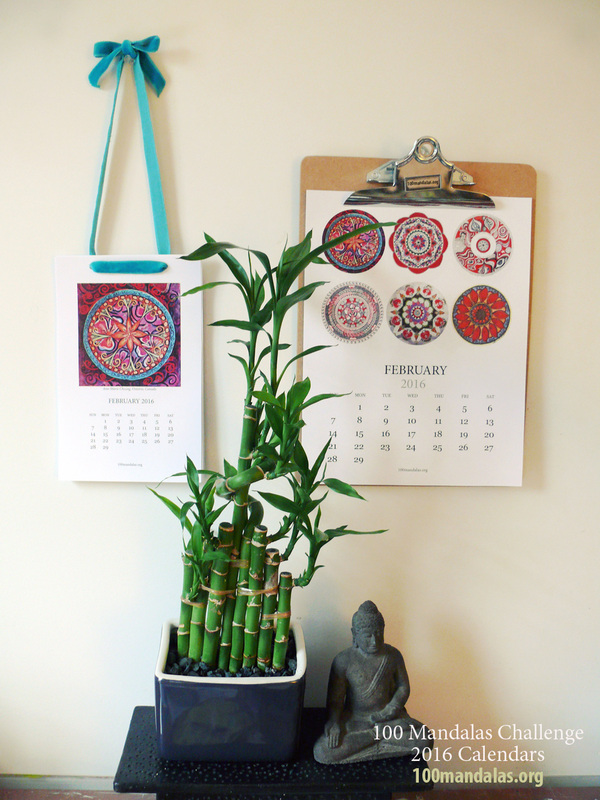 Another way to display the calendar is to pick up one of those inexpensive acrylic frames. 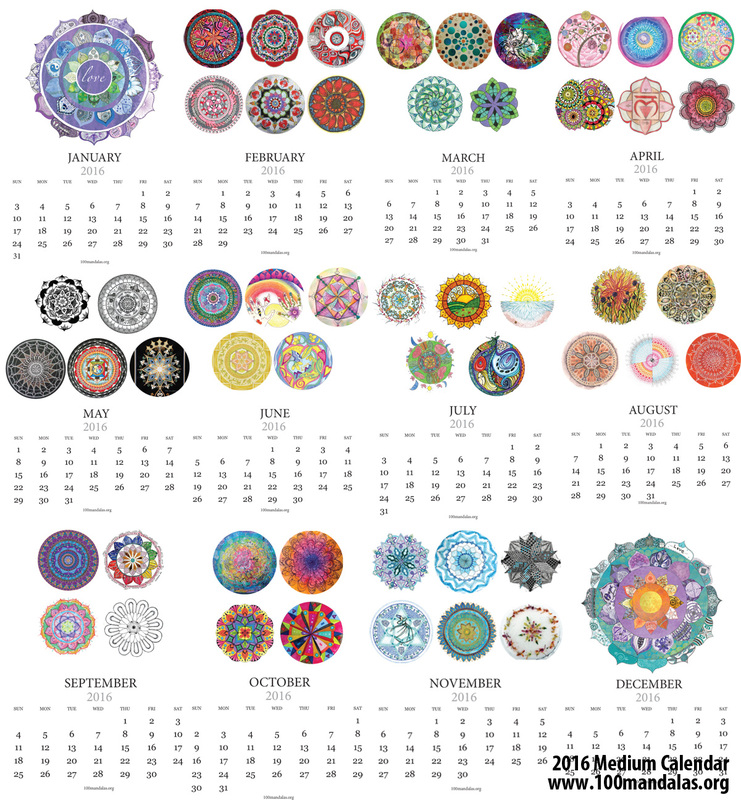 Here is a snapshot of all the mandalas and calendar pages. Click on any of the images in this post for a closer look. Do you see your mandala? These two calendars are now available for sale in my Etsy shop. The best part? You don’t have to decide which calendar to order as I’ve bundled these calendars together so you get both calendars! 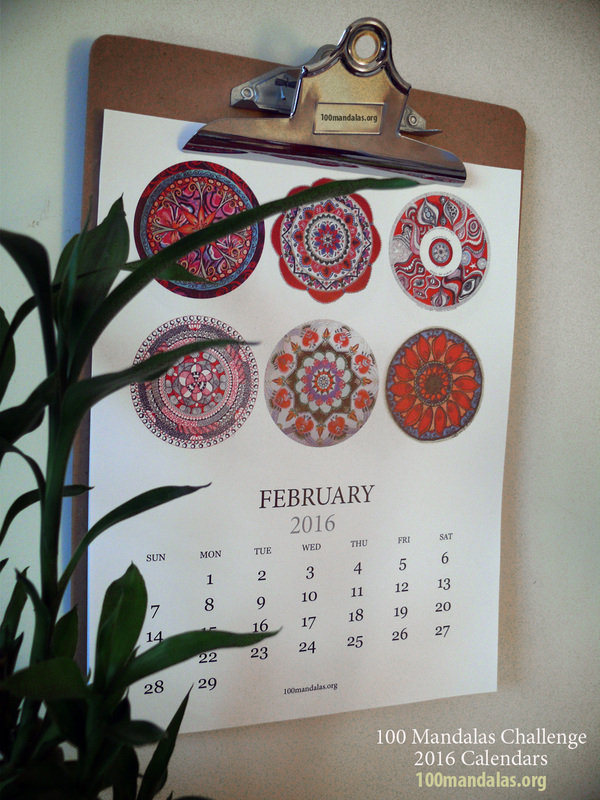 LEARN MORE and ORDER your 100 Mandalas 2016 Calendar. Tell your friends about this calendar. Post any of the photos from this page or share the photos that you see on the 100 Mandalas page on Facebook. 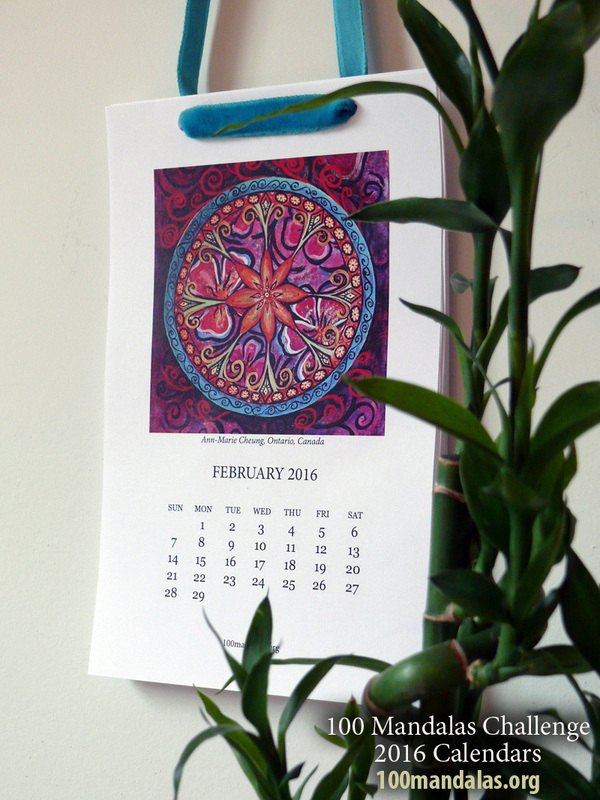 The sale of these calendars help to support the continued work for the 100 Mandalas Challenge and inspire your friends to join our community. Thank you!